Winter or summer, it’s important to keep the air conditioning system in your vehicle operating properly. For starters, you never know when a warm day might pop up and leave you sweating during your drive, or when you’ll have to roll the windows up to take a quick call and wish your AC wasn’t broken. Air conditioning also does more than just keep you comfortable, it aids greatly in defogging your windshield. In the cooler months, you may notice your windshield fogs up more often. That is because your windshield is cooled by the outside air, and your warm breath carries a lot of moisture with it. When the warm damp air meets the inside of your cold windshield, that moisture will quickly condense just as it does on a cold drink on a humid summer day. What simply leads to a water ring of your coffee table in the summer can lead to very poor visibility and dangerous driving conditions in the winter. Unlike your vehicle’s engine which can give you clues to why it’s malfunctioning through the check engine light, your air conditioning system will often make you search high and low for the reason it is malfunctioning. 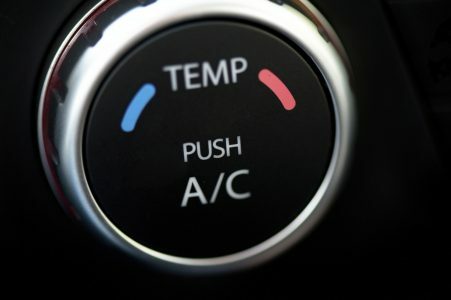 In this article, we’ll describe the most effective air conditioner troubleshooting techniques to help you figure out what is wrong with your vehicle. The first thing to do is check your system for visible signs of a problem. This is best done with your car parked, cool and the hood open. This inspection will focus mostly on the condenser. It looks like a thin radiator and will be mounted at the very front of your vehicle behind the bumped but in front of your radiator. First, check it for damage. This can include rock dings, dents, bent fins or broken tubes. 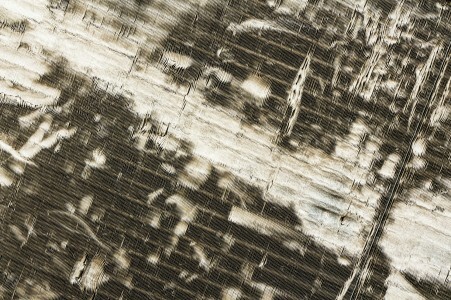 Rocks and road debris can easily damage your condenser which can be enough to stop your air conditioning from working. Next, with your car running, check to make sure 1 or more electric cooling fans turns on when you turn you AC on. If these fans are broken it could also be causing your AC system to malfunction. The next thing to check is your compressor. It will be driven by a belt and be at the front of your engine. The outside of the compressor pulley that is touching the belt always spins while the engine is running, but when you turn your air conditioning on, the compressor clutch should engage and cause the inside or center section of your AC compressor pulley to spin also. With your car running and the AC off, watch the compressor to notice which part is not spinning. Next, turn the AC on and check the compressor again. If the center section is spinning the problem most likely isn’t with your compressor. If the center of your compressor still isn’t spinning after turning your AC on, you either have an abnormal refrigerant pressure in your system, an electrical fault in your compressor, or a bad compressor. Next, check the low pressure side of the system. This can easily be done with an inexpensive gauge from your auto parts store, or even the gauge on a refill can of refrigerant. Depending on your car, your low pressure side should be between 25 and 40 psi with the compressor running. If your pressure is too low, chances are you are low on refrigerant. If the pressure is too high, you may have a bad compressor or a clog in the system. The last thing to check is the high side pressure. The high side pressure fitting is smaller and requires a relatively expensive gauge to read the pressure. If you’ve gotten to this point and still haven’t identified your problem, you may consider taking your vehicle to a mechanic. If you choose to measure this pressure make sure you get the proper set of AC gauges to measure safely and accurately. A low high side pressure may indicate a bad compressor and a high pressure may indicate a clog down stream of your compressor. Once you’ve completed these 4 steps of air conditioner troubleshooting, you should have an idea of what your problem is. The most common problem with AC systems in cars is a leak leading to a low pressure before the compressor, or on the low pressure side. If this is the case for you, don’t bother spending hours trying to hunt down the leak. Simply pick up a can of BlueDevil Red Angel A/C Stop Leak. BlueDevil Red Angel can be added to your air conditioning system where it will seek out and seal the leak quickly and easily. Thanks for your question about your Mercury Grand Marquis. Based on the problem happening in one day and the fact that your refrigerant is full, it sounds like your problem may actually be with the heater controls in your HVAC system. There is a small door that directs air over your heater core to warm it up, or allow the air to bypass the heater if you have the temperature set on a cooler setting. If that door or it’s operating mechanism is broken, it will give you heat all the time. To check the air blend door and actuator you’ll have to remove a significant amount of HVAC ducting and possible your dashboard so the repairs may be best left to a mechanic. I have a 2002 Honda Civic and it started blowing hot air recently. We added Freon and it started blowing cold air for a 2 days. I only put a small bottle so we added more Freon last night and it was blowing cold air. This morning the air is no longer blowing cold air and is hot. Please help. Thanks for your question about your Honda Civic. The problem you’re experiencing sounds like your AC system has a leak releasing the refrigerant you’re adding after a few days. We would recommend adding Red Angel AC Stop Leak (available here: http://store.gobdp.com/a-c-stop-leak-aerosol-00222/) to your system to seal the leak, then refilling your system with refrigerant one last time to get things back to normal. I own a 1996 chevy pickup, once i turn on my a/c i can hear the compressor working to push air out but it does not blow it out at all, whether its on low or high it does not blow air. If anything you can feel a slight breeze. But other than that the a/c will not blow cold nor hot air. Please help !. Thanks for your question about your 1996 Chevy Pickup. It sounds like your air conditioning system is working but the blower motor isn’t. Most likely it would be a problem with your blower motor resistor but could also be a problem with the fuse, the fan switch or blower motor. For more information about diagnosing electrical problems, check out our article about that here: https://gobdp.com/blog/diagnosing-electrical-problems/. Thanks for your question about your 1998 Honda Civic. When the clutch is engaged, the center section of the AC compressor should sping as fast as the pulley is spinning with the belt. It is relatively rare for AC clutches to slip, they usually either work or don’t. You could check to see if your compressor is working properly by measuring the high side pressure right after the compressor. If it is too low it would indicate there is something wrong with your compressor. Hi, I have a 2008 honda civic 1.8 petrol. I am having issues with intermittent a/c where by it will work when first turned on and then work (kind of) at higher revs but cut out in between and lose the kick at idling revs. My local garage checked the system, I am ok for gas and there are no leaks detected however they said the compressor is not kicking out the correct pressure. Could this be a problem with one of the pressure sensors or would it be in fact the compressor as they suggested? Thank you for asking about your Honda Civic. Based on your description, it does seem like the issues you are having is compressor related. Having the compressor replaced should return the A/C back to normal functionality. Feel free to contact our technical support line at 888-863-0426 with any other questions. My AC is not blowing cold air could it need coolant in the radiator. It is possible that the A/C is low on refrigerant, meaning that the vehicle is experiencing a refrigerant leak. We recommend using the Red Angel A/C Stop Leak to help stop the loss of refrigerant and then topping it off with R134-a to get it up to the proper level.